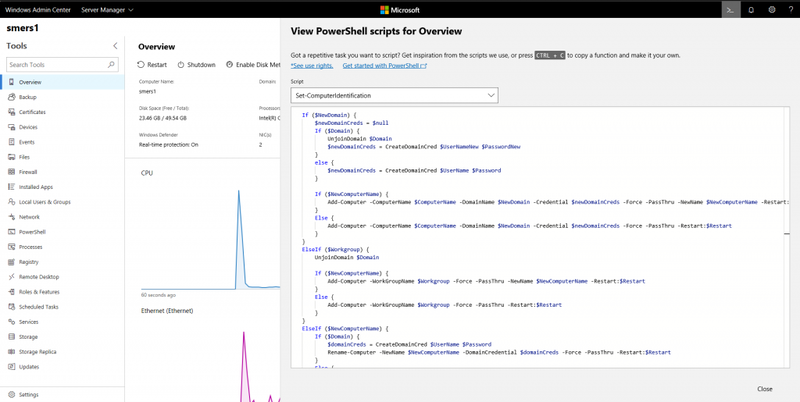 Earlier this year, Microsoft announced the Windows Admin Center, a new feature that helps organize the activities of IT administrators managing Windows Server and Windows. Administrators were having to deal with tasks like Event Viewer, Server Manager, Device Manager, Disk Management, so forth, separately and now they can find all these tasks bundled together much more easily. So far the Windows Admin Center, after originally being released in April as version 1804, has added an SDK preview, become the fastest growing Windows Server management toolset by June, and added three more regular previews since then: Windows Admin Center Preview versions 1806, 1807, and 1808. On Thursday, Microsoft announced that Windows Admin Center 1809 and its SDK are both now generally available, meaning that Microsoft considers the Windows Admin Center ready for use in production environments by organizations. You can download the Windows Admin Center version 1809 from the Microsoft website. For those who want to know what’s new in this 1809 version, you can keep reading. There are plenty of new features based on single server or single cluster troubleshooting, configuration and maintenance tasks thanks to user feedback. The new features include PowerShell scripts for actions in supported modules, enhanced scheduled tasks, enhanced file shares, the chance to View and remove currently installed Win32 applications, Hyper-V improvements, failover cluster improvements, editing and filtering improvements for tags, improve clarity in gateway settings, more organized notification system, and Windows Server 2008 R2 support as a connected target. Should you choose, you can take advantage of better Azure services from your on-premises environment. Now you can find and use Azure services directly from the Windows Admin Center. 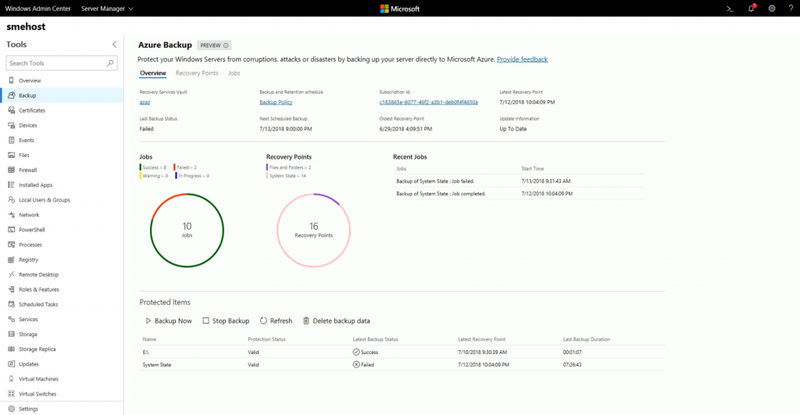 This includes the Azure site recovery, Azure backups, as well as Azure update management features. You’ll also find better security now with Azure AD authentication, an Azure network adapter so you can connect on-premises Windows Server 2016/2019 instance to an Azure virtual network, and the chance to manage Azure IaaS VMs on Windows Server. Hyper-converged infrastructure has always been a strong point to date, but with this update it gets even stronger again. All the features listed above apply to the HCI clusters too. The VMs list loads up to five times faster, and you get performance history included in the details page now. You also get more features with regards to Storage Space volumes, and new tools to manage and monitor your virtual networks. 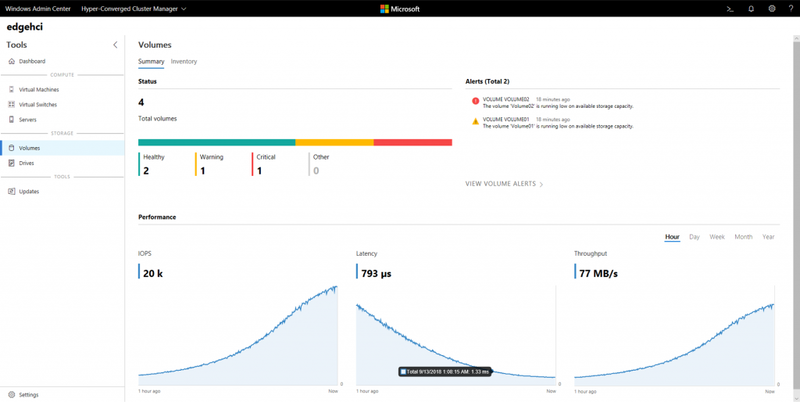 Windows Admin Center adds some features and improves on existing ones, too. You can now migrate servers without having to reconfigure apps or users. You can also set up and configure disaster protection easier than before by using the replication of volumes directly from the Windows Admin Center. 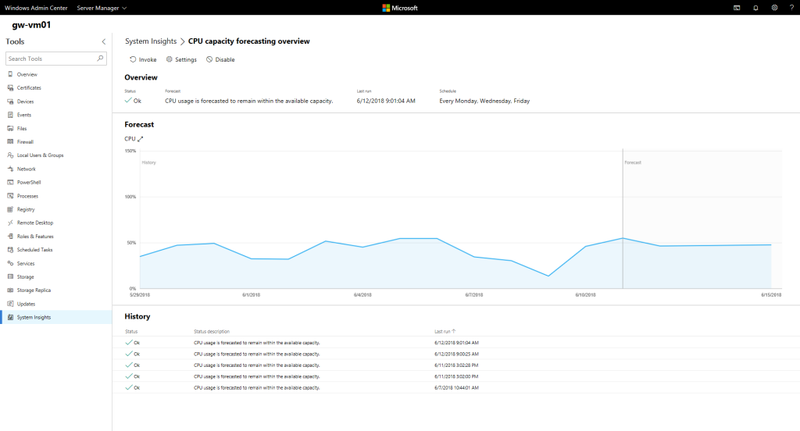 There’s also an option to manage native predictive analytics capabilities. Windows Admin Center wouldn’t have grown to what it is today without the help from extensions that come from third-parties. This includes the extension manager that allows you to get notifications about new extensions and existing extension updates. SDK’s are now made available thanks to the extensions coming from many third parties.